It can be difficult to estimate, by eye, just how far away a mountain lies. A peak can dominate a landscape and command our attention, filling our eyes and mind. Yet it can come as something of a shock to discover that such a prominent natural feature can still be a long distance from us. At 3317 feet (1011 meters) high, the limestone peak of Mont Sainte-Victoire is a pigmy compared to the giants of, say, Mount Fuji and Mount Rainier. But, like them, it still exercises a commanding presence over the country around it and, in particular, over Aix-en-Provence, the hometown of Paul Cézanne. Thanks to his many oil paintings and watercolors of the mountain, the painter has become indelibly associated with it. Think of Cézanne and his still-lifes and landscapes come to mind, his apples and his depictions of Mont Sainte-Victoire. Steeped in centuries of history and folklore, both classical and Christian, the mountain—or, more accurately, mountain range—only gradually emerged as a major theme in Cézanne’s work. 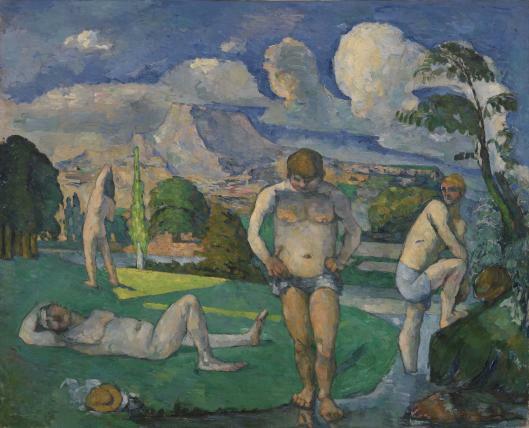 In the 1870s, he included it in a landscape called The Railway Cutting, 1870 (Neue Pinakothek, Munich) and a few years later it appeared behind the monumental figures of his Bathers at Rest, 1876-77 (The Barnes Foundation, Philadelphia), which was included in the Third Impressionist Exhibition of 1877. But it wasn’t until the beginning of the next decade, well after his adoption of Impressionism, that he began consistently featuring the mountain in his landscapes. Writing in 1885, Paul Gauguin was probably thinking of Mont Sainte-Victoire when he imagined Cézanne spending “entire days in the mountains reading Virgil and looking at the sky.” “Therefore,” Gauguin continued, “his horizons are high, his blues very intense, and the red in his work has an astounding vibrancy.” Cézanne’s legend was beginning to emerge and a mountain ran through it. 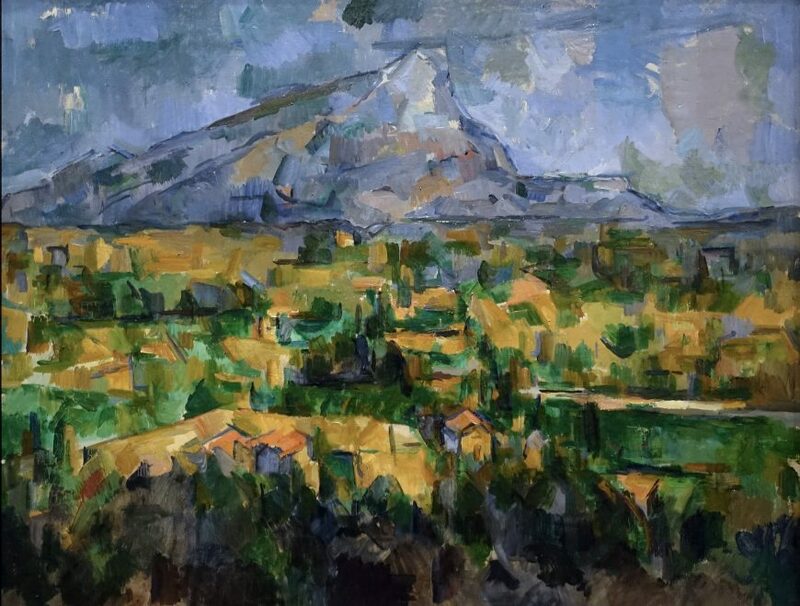 Cézanne would return to the motif of Mont Sainte-Victoire throughout the rest of his career, resulting in an incredibly varied series of works. They show the mountain from many different points of view and often in relationship to a constantly changing cast of other elements (foreground trees and bushes, buildings and bridges, fields and quarries). From this series we can extract a subgroup of over two-dozen paintings and watercolors. Dating from the very last years of the artist’s life, these landscapes feature a heightened lyricism and, more prosaically, a consistent viewpoint. They show the mountain as it can be seen from the hill of Les Lauves, located just to the north of Aix. Cézanne picked up a box in the hall [of his studio] and took me to his motif. It was two kilometers away with a view over a valley at the foot of Sainte-Victoire, the craggy mountain which he never ceased to paint[…]. He was filled with admiration for this mountain. Cézanne consciously cultivated his association with the mountain and perhaps even wanted to be documented painting it. When they visited Aix in 1906, the artists Maurice Denis and Ker-Xavier Roussel found themselves being led to the same location. In an oil painting by Denis and in some of Roussel’s photographs, we see Cézanne standing before his easel and painting the mountain. Again! It was the view we can see in most of Cézanne’s late views of Mont Sainte-Victoire, including the painting that concerns us here, which is now in the Philadelphia Museum of Art. In this work, Cézanne divides his composition into three roughly equal horizontal sections, which extend across the three-foot wide canvas. Our viewpoint is elevated. Closest to us lies a band of foliage and houses; next, rough patches of yellow ochre, emerald, and viridian green suggest the patchwork of an expansive plain and extend the foreground’s color scheme into the middleground; and above, in contrasting blues, violets and greys, we see the “craggy mountain” surrounded by sky. The blues seen in this section also accent the rest of the work while, conversely, touches of green enliven the sky and mountain. In other words, Cézanne introduced subtle adjustments in order to avoid too simple a scheme. So the peak of the mountain is pushed just to the right of center, and the horizon line inclines gently upwards from left to right. In fact, a complicated counterpoint of diagonals can be found in each of the work’s bands, in the roofs of the houses, in the lines of the mountain, and in the arrangement of the patches in the plain, which connect foreground to background and lead the eye back. Cézanne evokes a deep, panoramic scene and the atmosphere that fills and unifies this space. But it is absolutely characteristic of his art that we also remain acutely aware of the painting as a fairly rough, if deftly, worked surface. Flatness coexists with depth and we find ourselves caught between these two poles—now more aware of one, now the other. The mountainous landscape is both within our reach, yet far away. Comparing the Philadelphia canvas with some of Cézanne’s other views of Mont Sainte-Victoire and with photos of the area can help us to grasp some of the perceptual subtleties and challenges of the work. Take the left side of the mountain. Though the outermost contour is immediately apparent, inside of it one can also discern a second line (or, more accurately, a series of lines and edges). The two converge just shy of the mountaintop. The area between this outer contour and the interior line or ridge demarcates a distinctive spatial plane; this slope recedes away from us and connects to the larger mountain range lying behind the sheer face. Attend to this area, and the mountain seems to gain volume. It becomes less of an irregular triangle and more of a complicated pyramid. Or look again at the painting’s most obvious focus of interest, the top of the mountain. 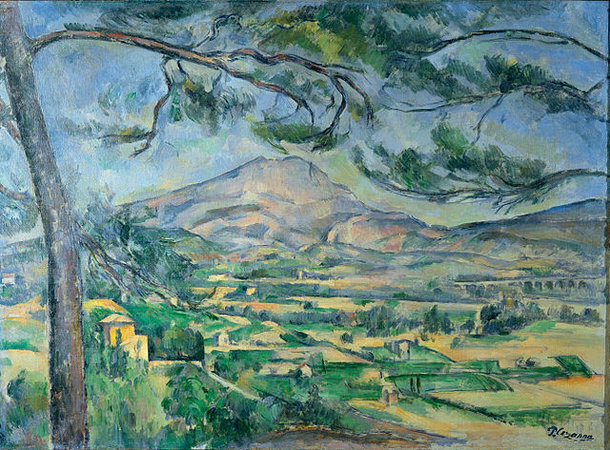 Cézanne’s other works show that the mountain has a kind of double peak, with a slightly higher point to the left side and a lower one to the right. At first glance, the Philadelphia canvas seems to contradict this: the mountain’s truncated apex appears to rise slightly from left to right. But a closer look reveals that Cézanne does respect topography. The small triangular patch of light gray—actually the priming of the canvas—can be read as belonging to the space immediately above the mountain or perhaps as a cloud behind it. Thus it is the gray and light blue brushstrokes immediately below this patch that describe the downward slant of the mountain top. Curiously, in one respect, our point-of-view is actually a little misleading. At an elevation of 3104 feet (946 meters), the left peak is not the highest point, but merely appears to so from Les Lauves. A huge iron cross—la croix de Provence—was erected on this spot in the early 1870s, the fourth to be placed there. Though visible from afar, the cross appears in none of Cézanne’s depictions of the mountain. Cézanne had presumably stood on this summit, or these summits, several times. He had thoroughly explored the countryside around Aix, first during youthful rambles with his friends and later as a plein-air artist in search of motifs. And we know for certain that he had climbed to the top of the mountain as recently as 1895. 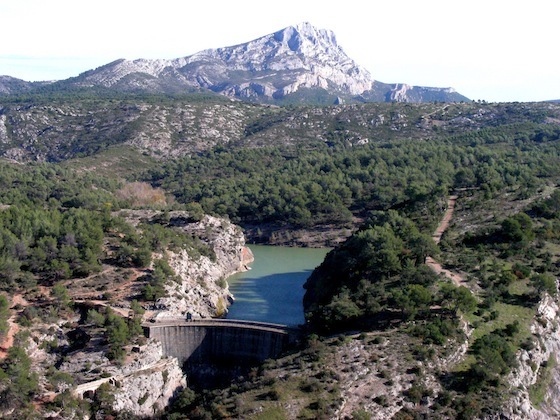 Armed with these experiences, he could have estimated the distance from Les Lauves to the top of Mont Sainte-Victoire with some accuracy—it’s about ten miles (16 kilometers) as the crow flies. When he stood on the mountain in 1895 Cézanne had, so to speak, entered into one of his own landscapes. As he stood there, perhaps he paused to recall some of the paintings of Mont Sainte-Victoire he had already made. But, to return to Gauguin’s language, could he possibly have dreamt of the works he would go on to paint in the following decade—works like the Philadelphia landscape, with its high horizon, intense blues, and astounding vibrancy? Cite this page as: Dr. Ben Harvey, "Paul Cézanne, Mont Sainte-Victoire," in Smarthistory, August 9, 2015, accessed April 23, 2019, https://smarthistory.org/cezanne-mont-sainte-victoire/.